I can't take any credit for the name of my blog. That credit goes to Bob Braun. On the polished floor of the community center in Millburn’s Taylor Park, a small group of children sat quietly, hands folded, as their mothers chanted:"What do we want? A vote! When do we want it? Now!" while an assortment of politicians pledged obeisance to what these parents demanded: An end to the unchecked growth of charter schools. And Braun had it exactly right. This is a mothers' crusade; mothers that refuse to accept the top down style of leadership of Acting Commissioner Cerf and Governor Chris Christie. Perhaps Christie and Cerf thought they could come into New Jersey and tell the parents of this state how best to educate their kids, but they were sadly mistaken. There is a world of difference between claiming, as the Klein-Rhee statement does, that the single biggest factor in student success is teacher quality and claiming, as Barack Obama does in his more careful moments, that the single biggest school factor is teacher quality. Decades of social science research have demonstrated that differences in the quality of schools can explain about one-third of the variation in student achievement. But the other two-thirds is attributable to non-school factors. Reformers attempt to pit parents in "high performing" schools against parents in "failing schools", and parents across the state against the teachers that educate and care for their children. It is time we tell them that we're not falling for their divisive rhetoric. Instead, we want a fully funded education system that works for all students and we want to work with our kids' teachers, administrators and school boards to build strong, vibrant learning communities. And yes, we even want to work with Acting Commissioner Cerf's Department of Education towards this same goal. No one talks more about how they're only in it for the kids than Chris Cerf, as if to somehow imply that everyone's motives, other than his, are suspect. And in this same unabashed love letter Peter Meyer says Cerf "is spending time establishing the process by which he will dismantle, then rebuild, New Jersey’s education system." Note to Acting Commission Cerf. Let us be clear. New Jersey's parents will not stand by and allow you to dismantle the schools that have served so many of our children so well. Pure and simple. New Jersey reformers like Laura Waters will no doubt continue to write off the organizers of Save Our Schools NJ as shills for the NJEA. A parent revolution is much harder to defend against. Yeah, we wouldn't want the majority of parents in a community to get to decide how their children should be educated. Ravitch said that Education Next's Book of the Decade was chosen by popular vote - so she tweeted it, and her followers voted. When the EdNext folks saw that she was in the lead they extended the time for voting. So she re-tweeted it. She told this story to make it clear to those in attendance that the reformers may have money and power but we have truth and numbers. 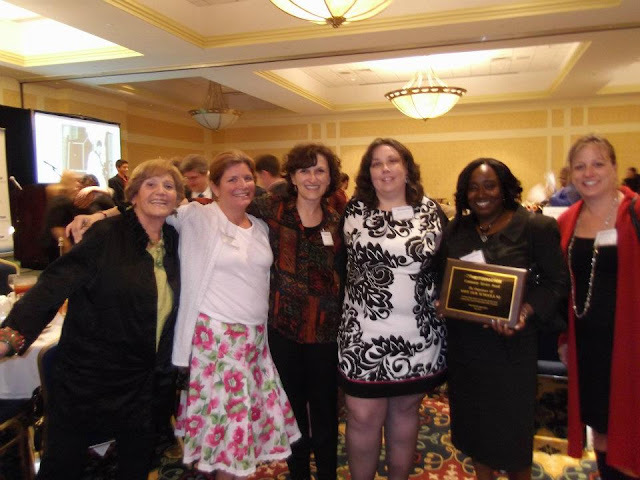 That same night the organizers of Save Our Schools New Jersey received a Community Service Award from New Jersey Citizen Action. Here are some of the fearless mothers that were in attendance to accept the award. And on the plaque it says the award is for their "tireless efforts to ensure that all New Jersey children have access to high quality education." So to all the Mother Crusaders: We truly are fighting for the future of public education for ALL children, not just our own. TRENTON - The following charter school applications have been qualified for the approval process, the state Department of Education. Approval decisions will be made later, officials said. The following applications are listed by name, grade levels, number of student they are projected to take in, and the municipalities which they will serve. Grades kindergarten to 12, with 1,040 students projected, Newark. STEMS (Science Technology Engineering Math Sustainability) Preparatory Charter School, grades kindergarten to 5, 240 students. Why is this of any interest? Because back in March, before the current application cycle started, I noticed that the NJDOE had posted a Timeline, and that in that Timeline they formalized the two stage application process that they pulled out of nowhere in the last round. (If you ask me, it was to quiet to storm whipped up by my good friends in Teaneck) There were no regulatory changes that gave them the go ahead to change the application procedure - they JUST DID. 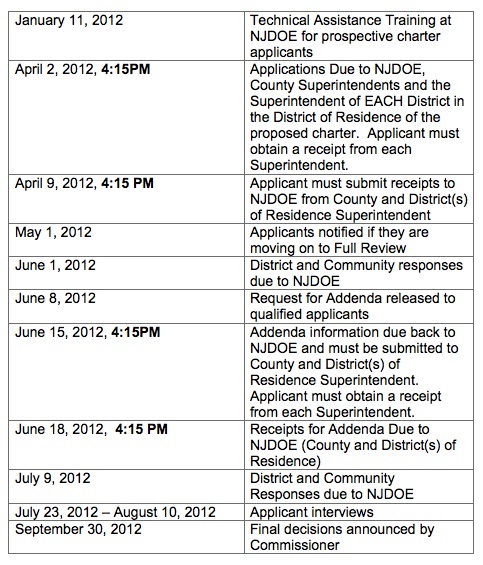 I modified the Timeline to include dates that districts would have to respond to applications. Something the NJDOE can't be bothered to do. Clearly, district input is really integral to the process. Yeah, he didn't mean it. I have to admit, for a minute there I actually thought maybe I had scored one for the good guys! Maybe they were going to change the Timeline so that districts would get 60 days from the announcement of which applications made it to "Full Review!" Sadly, no. Here is how they changed the Timeline. They just completely removed the "Full Review" date on May 1st. But as you can see, they went ahead and did it anyway. Oh, and big surprise, in the changes to the regulations Cerf proposes a "two phase" application process. "Phase one" applicants deemed to be “qualified applicants” will be notified and given 30 days to submit their "phase two" application. Districts will be allotted 30 days to respond to a phase one application, and 60 days to respond to a phase two application. Great, MORE work for districts faced with unwanted charter schools!! So here is yet another example of Cerf's NJDOE playing by their own rules. Clearly, they don't expect anyone to be paying attention. When someone comes along and not only notices, but calls them on it, what do they do? They continue to do whatever the hell they want. I guess the only reason they are bothering to change the regulations is to get rid of nuisances like me and Jersey Jazzman. If they get to make the rules so that the game is rigged in their favor, there is nothing to catch them on. You wouldn't think a suburban mom would take changes to charter school regulations personally. But I am. I really am. There are some big changes here, and I will continue to outline them in the coming days and weeks. But you know what? The NJDOE has been operating as if many of these changes are already in effect. I have caught them not adhering to the existing regulations on more than one occasion, and I have spent countless hours of my life not only catching them, but holding them accountable. So now they are going to just go ahead and officially make the changes to the regulations they haven't been following in the first place? "Eligible applicant" means teaching staff members, parents of children attending the schools of the district board(s) of education, a combination of teaching staff members and parents, or an institution of higher education or a private entity located within the State in conjunction with teaching staff members and parents of children attending the schools of the district board(s) of education. The regulations and statute are clear that eligible applicants must be parents or teachers of PUBLIC SCHOOL children in the "schools of the district board(s) of education" where the charter is being proposed. In the third Tikun Olam application, two of the qualifying founders were parents of children in private yeshivas, and the other qualifying founder was the parent of a child that attended public school, but in another district entirely. None of them were teachers. We (me and my fellow Tikun Olam opposition team members) immediately notified the NJDOE. We got no response. Being the novice that I was, I thought I had found this incredibly egregious thing, and tried to get the press to pay attention. We got no response. This was when I realized that the charter school law and regulations were ostensibly meaningless. The NJDOE was interpreting them as they saw fit, and no one really seemed to care. Allow me to prove it. Here is the Application Evaluation Tikun Olam founders received after the third denial - after we had already alerted them to the fact that there was not ONE qualifying founder on the application. There is absolutely no mention of the fact that the three qualifying founders are not eligible applicants. In fact, the first line of the assessment praises the founders for their "breadth of knowledge and expertise." And now check out the request for addenda the Tikun Olam founders received during the fourth application cycle. Highland Park was dropped from the application, and the founders managed to find someone in New Brunswick with one kid in the public schools, but their Edison Qualifying Founder was still a private school parent. In Section 1.9. Founder Information, the applicant is asked to provide an "additional qualifying founder for Edison Township as per N.J.S.A. 18A:36A-4" (the same statute cited above). Note, this was the FOURTH TIME the same qualifying founder had been on the application, and the NJDOE had never raised an eyebrow. The NJDOE only acknowledged that he was not an eligible application AFTER we had put tremendous public pressure on them with a Town Hall meeting and by Occupying the DOE. Coincidentally, this was right around the time Michael Winerip started asking a lot of questions to research his story on Tikun Olam for the New York Times. The current charter school law and regulations ensure that parents and teachers in the public schools of a district can identify a need in their schools and create an alternative to address that specific unmet need. With the proposed changes, a teacher from anywhere in the state and/or a non-public school parent, can come into the public schools of a district and tell the parents that rely on those public schools what charter they are going to get. And the all powerful Commissioner can come in from up on high and approve it against the wishes of the district. And there would be no way to fight it. Back In February I blogged about the (lack of) enrollment for the Regis Academy approved in Cherry Hill. Cherry Hill community members had attended a Regis Academy Board Meeting and heard Amir Khan bragging that the NJDOE had allowed him to expand his districts, and that he could start pulling kids from Hoboken if he wanted! I did some digging, via OPRA, and learned that he had indeed requested to expand his districts. In fact, he sent a letter to Deputy Commissioner Andy Smarick which contained enrollment projections for eight districts, not just the four he was approved to serve. Days later the Courier Post followed up with an article (sorry, unavailable already...) stating that the NJDOE claimed they DENIED Regis' request to expand their districts. I blogged about this too, and added that I learned from both Cherry Hill and Lawnside representatives that despite the NJDOE's claim that they had denied Amir Khan's request, they had sent out revised budget projections to their districts based on the numbers Amir Khan sited in the above letter. Again, once the proposed regulations are in place, the Commissioner would be able to expand Regis' districts after approval. Oh, and not for nothing, but Amir Khan was the qualifying founder for Voorhees on the Regis Academy application. He has no children currently in the Voorhees public schools and he is not a teacher. Big surprise, right? His application was approved but he was not even an eligible applicant. The proposed changes enable just about anyone in the state to apply for a charter. The Commissioner retains his ability to approve a charter against the wishes of a district that will be forced to pay for it. And once a charter is approved the Commissioner can expand the charter in any way he sees fit, including adding additional districts or opening additional campuses in other districts, so long as they are former Abbott districts or have even just one "priority" school. So now you know why I take this so personally. Presently there are at least regulations in place that provide some protection to districts that are having charters they don't want or need foisted on them by individuals with absolutely nothing at stake in their public schools. I have been able to rely on these regulations to stop the NJDOE from acting with reckless abandon and running roughshod over these districts. If Acting Commissioner Cerf has his way he will be almost entirely unaccountable to districts and taxpayers. I for one am going to see if I can't figure out a way to stop this. I've been spending a fair amount of my time thinking and reading about the proposals Acting Commissioner Cerf has put before the State Board of Education. To date, the changes to high school testing requirements have gotten the most press attention, and the changes to the charter school regulations have taken a back seat. I am sure this will change in the coming weeks, and if nothing else I certainly plan on addressing the proposed changes to charter school regulations in depth. Before I dive in, I want to take some time to look at what the recent proposals tell us about Governor Christie and his Department of Education. 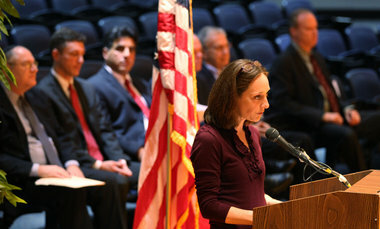 Their piece included a document that showed the percentage of vocational and charter school students that pass the HSPA. I couldn't help but notice that Camden's LEAP Academy Charter School was on the list, and was blown away by what I saw. Some of you may remember I spent a bit of time looking into the "success" of LEAP Academy after I testified before the Assembly Education Committee hearing in February. LEAP students were paraded before the committee as examples of how charter schools are the best (only?) hope for the students in places like Camden, and any semblance of local control would potentially destroy the "success" of the charter school movement. LEAP Academy's biggest claim to fame is that they graduate 100% of their senior class. This apparently has not changed, even with the new formula which has significantly changed the graduation rates for other districts and charters. What doesn't seem to get any attention however is that apparently only 56.9% of those students can pass the HSPA, compared with 82.2% statewide, and that the other 43.1% graduate by taking the AHSA, by appeal or "other means". So what's the difference between passing the HSPA and the AHSA? The AHSA is a more open-ended exam than the HSPA, providing more time and performance-based formats for the language arts and math tests. It was first devised in the 1980s as an exam for those who struggle with the pressures of standardized testing. But over the years, the exam – then known as the Special Review Assessment (SRA) -- became more the norm in some districts where failing rates on the HSPA were high, and it drew increasing criticism for being too easy to pass. Specifically, some said its looser time limits and scoring, often by the students’ own teachers, had led to a test almost impossible to fail. Question: What’s your reaction to Christie’s announcement that the HSPA would be phased out as a high school test and replaced by end-of-year exams? Jeffrey Yu, 18, senior, WWP South: “At West Windsor Plainsboro South, there hasn’t been a year when a kid didn’t pass the HSPA. It’s an easy test for our district. For myself, I definitely thought it was pretty easy. I love that the Governor is being schooled by students that actually understand what skills are taught at what grade levels. But most importantly, if the AHSA is "almost impossible to fail" and the Governor thinks the HSPA only measures 8th grade proficiency, what does that say about the graduation rate claims at LEAP and the education those graduates are actually receiving? But yesterday was less about the details and more about the politics and promises, with Christie and Cerf finally putting some flesh on their longtime claims that New Jersey’s schools don’t demand enough of their students. Let's back that up a minute, Governor. It's about accountability? Are you for real? LEAP is being held up as a model of what charters can do for students, but only 56.9% of them can pass the test you say is at an 8th grade level!?! Nonetheless, LEAP touts a 100% graduation rate and gets showered with praise from legislators, the Department of Education, and the NJ Charter Schools Association and endowed with new facilities to the tune of 12.5 million. And not only that, they use their graduation rate as a club to beat the Camden Public Schools, the schools that actually have to try to teach the ESL and LEP students LEAP doesn't seem to serve. Then this morning there was an amazing opinion piece in the Asbury Park Press that nailed the problem right on the head. Christie says too many graduates leave high school unprepared for their next step, and that these changes are aimed at correcting that. We can’t argue with that. But the way to accomplish that isn’t by simply ratcheting up the demands and waiting to see how it all shakes out. Raising the bar is a wonderful concept unless it’s being used primarily as a weapon to exclude more people from reaching a certain level of achievement. If Christie simply wants to chop the graduation rates down a few notches and leave more students without diplomas, that’s an irresponsible approach to reform. Christie’s ongoing disdain for the quality of public education in New Jersey remains one of his biggest failings as governor. While there has always been some merit behind his criticisms of the teachers union, his attacks have extended far beyond legitimate gripes. And then there's the NJDOE's "secret proposal" that became public this week for the Camden Public School District. It calls for the closure of ten traditional public and three charter schools. While Christie says he has "no plans to enact the DOE scenario" the document is a clear example of Christie and Cerf's leadership style, which was perfectly explained by Diane Ravitch yesterday. In fact, what the document shows is a Department of Education that does not know how to help public schools, that doesn’t believe in helping public schools. It shows leaders who are clueless about education. The plan begins by saying that asking how to improve the schools is the wrong question. That’s old-style thinking. As usual, Dr. Ravitch nails it. The only thing the education policies and proposals of the Christie administration and Acting Commissioner Cerf's NJDOE demonstrate, including their proposed changes to high school testing requirements, is that they don't believe in actually helping public schools. In fact, they are clueless about education. This Just In! B4K Is Linked To The NJEA!! Last night I took on Laura Waters and her endless attempts to discredit Save Our Schools NJ by connecting them, no matter how tenuously, to the NJEA. She was pretty tickled with herself last May when she played the Kevin Bacon six degrees of separation game and connected the two groups. She did it again in August, this time without the cheeky game, merely presenting it as a fact that Save Our Schools NJ is not only connected to the NJEA, but that we are united in our "vested interest in quashing NJ's charter school movement." Wait, wait, this is a fun game! Let me try!! Laura Waters writes an anti-union EdReformer blog. She has garnered enough attention to write opinion pieces for NJ Spotlight. One of those opinion pieces was highlighted by the ed reform blog redefinEd (stay with us here) which is run by venture capital entrepreneur John F. Kirtley. So, Laura Waters is being paid by ed reformer venture capitalists to attack teachers unions! I knew it! No big surprise there. And then apparently Ms. Waters received an email from Kathy Mone about last weeks charter school panel discussion in Highland Park, and she saw her golden opportunity! NJEA "top brass" at an event sponsored by Save Our Schools NJ! FINALLY! She could prove the connection!! B4K and the NJEA co-sponsoring a panel discussion!?! I'll be waiting for Ms. Waters to blog indignantly about the connections between the NJEA and B4K as a way to discredit B4K. And since the audience will likely be "composed completely of NJEA top brass", as she so nefariously described the audience of the Highland Park panel, the credibility of the entire Grading The Teachers panel will have to be brought into question as well! I bet VINCE might even be there! Ms. Waters, I beg you. Quit it. It IS good for people on different sides of this debate to come together and hash things out. Your attempt to discredit Save Our Schools NJ as an NJEA plant merely because you can connect them by playing the Kevin Bacon game (for the record, I can connect myself to Kevin Bacon in four degrees) or members of the two groups are in the same room, is a slap in the face to over 7,000 parents and concerned citizens across the state, like myself, who joined because they want to see public schools work for ALL kids, not just THEIR kids. Laura Waters and Kathy Mone; New Jersey's Own Reformy Dynamic Duo! Below is my response to yesterday's bizarre blog post from Laura Waters about a charter panel discussion in Highland Park. The best part is that the panel was last week and Ms. Waters didn't even attend! Kudos to Ms. Waters for her journalistic integrity! Notice that Ms. Waters "source" regarding the event is Kathy Mone, who she describes as the Business Administrator for Elysian Charter School of Hoboken. On NJ Spotlight Ms. Mone is none other than elysiankathy. Some of you may recall that Ms. Mone came to Ms. Waters' defense on NJ Spotlight when the comments section EXPLODED in reaction to Ms. Waters' opinion piece, "The Charter Controversy -- Much Ado About Nothing". If the "charter controversy" is "nothing" then what are these two ladies so riled up about? To Ms. Waters and Ms. Mone: How about you guys organize and host a charter panel discussion? You can have it in Hoboken, Lawrence Township or Camden, you decide. I will be happy to travel anywhere to attend. Heck, I'll even participate and blog about it. Give me a date and I will mark it on my calendar. Have you read Bruce Baker's recent post about how "public" charter schools really are? "Those who casually (belligerently & ignorantly) toss around the rhetoric that “charters are public schools” need to stop. This rhetoric misinforms parents, teachers and taxpayers regarding their rights, assumptions and expectations." Last week's event, which I organized on behalf of Speak Up Highland Park, in conjunction with Save Our Schools NJ and Education Law Center, was videotaped. I will gladly send you a copy for your review so you can hear the responses to Ms. Valentine's question for yourself. You will then also have the framework of the entire evenings discussion to inform your understanding of the event. Although, from my experience with your blog, you are more than happy to write without full knowledge of your subject matter. Until I can get you the video, here is a New Brunswick Patch article about the event that you may find informative and less challenging than Mr. Braun's piece. Your mischaracterization of the event is unfortunate. First of all, Carlos Perez was invited and declined to participate, and a charter founder was on the panel. Every attempt was made to be inclusive and represent all sides of the debate. Panelists tripped over themselves to talk about charters, like Emily Fischer, that serve kids that represent their host community. And not only was Ms. Valentine not the only person of color in the audience, the audience was not "composed completely of NJEA top brass, Rutgers professors and a few others." I spoke with several graduate students and parents as they left the event and said they walked away with a fuller understanding of how the charter school debate is tied to the current push to undermine local democratic control of public education. I find it endlessly fascinating that the school board president of a wealthy suburban district has anointed herself the "Champion of Camden" and then casts aspersions on Save Our Schools and ELC for a supposed "absence of inner city stakeholders." Ms Waters, the moderator of the event, ELC's Stan Karp, was a teacher in Paterson for 30 years. What experience do you have in Camden that makes you more of an authority on the wants and needs of inner city public school students and parents? School board president Laura Waters pointed out that the school district budget, which failed by about 200 votes, was already $500,000 under the state-mandated cap. Cutting the budget by an additional $700,000 would bring it to $1.2 million below the cap, she said. ”That’s a really hard hit for us,” Ms. Waters said. Well Ms. Waters, how's it feel to lose local control? This blog has been severely neglected lately. Sometimes life just gets in the way, but I have really missed blogging, and some HUGE things have happened!! We're not done yet though parents, not by a long shot! Not here in Highland Park, and certainly not in the state of New Jersey. Here in Highland Park, Tikun Olam still has that $600,000 grant. 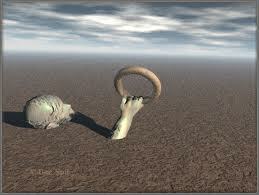 The denial in the last round did not terminate the grant. It's still theirs, and they could still reapply to the NJDOE for a charter in October. I have spoken twice with Congressman Frank Pallone about this issue, as have other Highland Park community members, and he said he will contact the USDOE and ensure they make good on USDOE spokesman Justin Hamilton's statement to Michael Winerip in his Tikun Olam story. Mr. Hamilton, the federal spokesman, said that if the Education Department “becomes aware of material factual misrepresentations,” it could terminate the grant. I intend to make sure this happens. If it doesn't, I will update this blog with contact information for both the responsible parties at the USDOE and also for Congressman Pallone's office so more concerned parents can remind him that we do not want this charter in our community and we want his help to make this right. And hold onto your hats folks, because we are on the cusp of perhaps our biggest charter battle to date in the state of New Jersey. The NJDOE and Governor have faced steep opposition to their charter agenda, leading WNYC's Nancy Solomon to conclude that the suburban charter school battle could be Christie's Waterloo. Not so fast says the NJDOE! Tomorrow morning the State Board of Education will meet at the NJ Department of Education and on the agenda are proposed changes to the charter school regulations. The board will get its first look at new charter school regulations that the administration contends will add both flexibility and accountability for charter schools. The proposed regulations would create a two-tier application process that will allow the department to focus more on applicants ready to open, but also provide more time for local districts to review applications as well. The new regulations would also provide new options for the commissioner to deal with lower-performing charters, and ease some provisions in the existing regulations that have been seen as an obstacle to online charter schools. I got a sneak peek at the new regulations yesterday before NJ Spotlight published them this morning and have already done an analysis, which I hope to post shortly. The proposed changes exemplify EVERYTHING that is wrong with the NJDOE under Acting Commissioner Cerf. They give the Acting Commissioner unlimited power to put charters in former Abbott districts or any district with a Priority School, the ability to control how charters grow and expand into other districts, and grants him limitless control over the renewal or closure of a charter. All of these new powers come with next to no input from the districts and communities that will pay for these charters. The sweeping changes proposed to the regulations, without the careful review of the legislature, are unconscionable, but par for the course for this administration and this Acting Commissioner. I will be writing much more about this power grab in the coming days and weeks. We all have to work together - parents, educators, and concerned citizens - to STOP the likes of Acting Commissioner Cerf and his Broad infested NJDOE. Cerf will stop at nothing short of total control over charters to further his agenda to privatize public education.